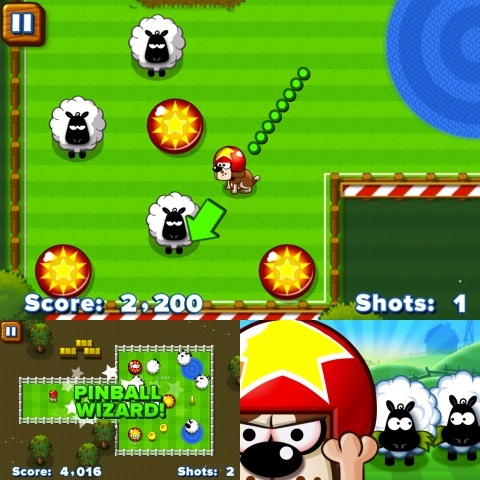 Sticky Sheep is a new iOS game from iPod Touch and iPhone app developer Chillingo. Combining elements of billiards, pinball and mini golf, Sticky sheep adds a fresh new spin on the already popular touch based physics genre. Whilst the game might seem a little simple, it is hard to fault its cute design, and you may just be surprised by just how tricky some of the later levels can be. In this review, I will be pointing out Sticky Sheep’s pros and cons, and will determine whether it is worth its 99 cents. Upon loading the application on my iPhone 4S, I was immediately greeted by the main character of the application, Baxter the Beagle. Now beagles aren’t the traditional choice for herding sheep, and that might be why the gameplay involves you firing Baxter around the playing field, in a similar manner to a game of billiards, instead of a more traditional sheep-herding approach. 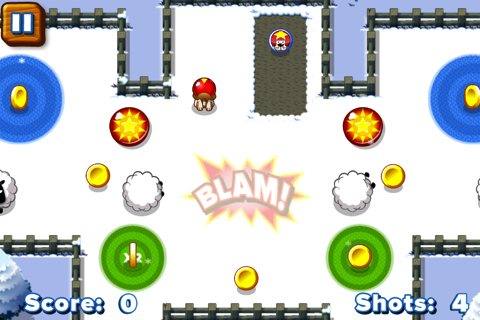 players familiar with titles such as Angry Birds will be immediately at home with the controls found within Sticky Sheep. Players control the trajectory and force of the canine sheep wrangler with intuitive finger pulls. Once ready, Baxter is released, and if all goes to plan, will hit the targets dotted around each stage. Don’t worry about any near misses however, as the targets attract Baxter to them. The controls in this title are so simple, it is very hard to fault them in any way. For its low price, Sticky Sheep has more than its fair share of diverse levels and gameplay. For example, there are different environments acting as the playing field. These environments range from lush green fields to dry, dusty deserts and there are a multitude to unlock. Sticky Sheep has more than just Baxter, sheep and targets to think about. Each level contains factors such as coins that you need to collect, or powerups such as Rams who break down barriers for you. Sticky sheep manages to look great during all of this chaos as well, with a clean, family friendly look that is hard to dislike. Sticky Sheep has some great audio, with a diverse range of tracks and sound effects that don’t ever get too annoying. There are a few issues within Sticky Sheep however. For example, you will find that a lot of the display goes unused and this can result in a rather dull looking level. The second issue is due to the fact that whilst the games physics are generally quite tight, baxter sometimes rolls much further than you would like him to. If you like cute physics based puzzle games, their aren’t too many iPhone apps better than Sticky Sheep. AppSafari review of Sticky Sheep was written by Joe Seifi on March 6th, 2012 and categorized under App Store, Games, iPad apps, Physics Based, Puzzler, Universal. Page viewed 3904 times, 1 so far today. Need help on using these apps? Please read the Help Page.